Salesforce provides a tool called Wsdl2Apex that allows you to generate Apex classes from a WSDL. These Apex classes act as a proxy for invoking the web service methods. The generated Apex classes require code coverage, which needs to be created manually. You need to import the entire WSDL. In many cases you may only require a subset of the web methods. Reducing the number of methods cuts down the lines of Apex (a limited resource) that are generated and subsequently the number of lines requiring code coverage. Support for complex types that extend a base type. <xsd:extension base="foo:Bar">. The ordering of the generated methods appears to be arbitrary (maybe hash based ordering internally?). At the very least, a small change in the input WSDL can produce Apex that doesn't diff very well. This can be a pain with source control and tracking the history of changes. I've been working with an intern student here at FuseIT to create a replacement tool as part of the FuseIT SFDC Explorer under the new WSDL tab in the 1.0.0.47 release. The current release is aimed at having reasonable feature parity with the existing Salesforce Wsdl2Apex implmentation. Import a WSDL from URL or local file. Publish the Apex classes directly into a Salesforce Org via the Tooling API. Generate test Apex methods and mocks that give 100% code coverage for the generated callout code. Generate HttpRequest web service calls as an alternative/backup to the WebServiceCallout.invoke calls. Generate a WebServiceMock class with expanded request/response objects and doInvoke implementation. Generate a wrapper Apex class that will revert to the mock implementation with running in a test case context. This could also expose the end point and timeout settings as properties. Salesforce StackExchange Any way to easily create unit tests for a wsdl2apex generated Apex class? Thanks. There are still several areas that we will be expanding it. Please do let us know if you find a problematic WSDL. Hi, I found problematic WSDL. I've tried generate SpringCmService WSDL and seems that there is the problem with inheritance. The generated apex class has errors and can not be deployed to SFDC. Hi. Are you able to share the WSDL URL with me? I'll give it a test to see what the issue is. Also, what version of the sfdc explorer are you using? The missing class SCMSecurity is based on a simpleType in the WSDL with the possible values: None, See, Read, Write, Move, Create, SetAccess. I'll need to look at updating the tool to support this. In the short term, you could manually edit the generated Apex Class replacing "wwwSpringcmComAtlasWebservicesV2013.SCMSecurity" with "String". Then just ensure you only set a valid value. Thank you Daniel for quick response. it is not the only problem. There is also issue with inheritance. In WSDL: SCM Document extends SCMObject and SCMObject extends SCMBaseObject. SCMObject inherits properties from SCMBaseObject, but from SCMDocument I don't have an access to them. In short scmDocument object doesn't inherit the SCMBaseObject. We've updated to tool to handle multiple levels of inheritance. It will now pull the required fields from the extended complex types as required. Please get v1.16 or later to get this update. There is still a potential issue with the in SCMSecurity. In your case you can just space seperate the listed restriction values and it should work fine. Very useful tool for Salesforce developers. I am battling to generate Apex stub classes from a RPC / encoded style WSDL. Would it be possible for you to have a quick look at the error? I have tried also after covering the WSDL to a Document / literal style WSDL, but I still cannot parse the WSDL file. I am using version 3.2.16095.1 of the FuseIT SFDC Explorer. I would really appreciate some help. I Realy like the FuseIT explorer with the WSDL2Apex implementation. This gave me a booth start in converting wsdl 1.2 into Apex classes. Are you able to share the WSDL in question so I can check it to see what the output is? You mention wsdl 1.2. Did you mean SOAP 1.2? Unfortunately SOAP 1.2 isn't support at the moment as the underlying WebServiceCallout.invoke method provided by Apex doesn't support. Instead I'd need to completely generate all the Apex to manually POST to the service and then process the response. Indeed SOAP 1.2. De FuseIT explorer create's nicely the structure for the HTTP POST. I can share the WSDL but not then on a direct Email and not on the blog. I removed most of the WSDL (SOAP 1.2) unsupported items, but for the Attributes I could not. They need to be there. Single attributes are mostly converted into elements and if there are more then 1 attribute, they are being ignored. So I modified the classes manually. I send you a E-Mail with the WSDL. I'll keep an eye out for it. On which domain did you email me? I haven't seen it yet. Or did you use the support email in the explorer? I used the FishOfPrey gmail. I am very new to using apex SOAP callouts and I have seen your demo during dreamforce (through youtube) and was convinced to try it out. Unfortunately, after trying it out through this trailhead (https://trailhead.salesforce.com/en/modules/apex_integration_services/units/apex_integration_soap_callouts), it gave me an error after implementing a similar code with what the trailhead taught me through "Execute Anonymous Window". Below shows the details I've done. Thanks for reporting this. I can see differences in the generated *_type_info members for both doAdd and doAddResponse that are causing issues. 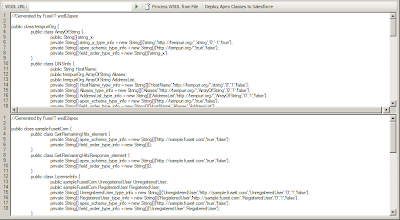 I'll need to review these in closer detail to determine why this particular WSDL is causing a difference. Hope this helps in your investigation and much thanks for the reply! The remote server returned an error:(500) Internal Server Error. Parameter name:webrequest. I've seen your error report. The existing wsdl2apex code attempts to retrieve the WSDL from the URL by appending the ?WSDL query string parameter. Note that it is upper case. It appears this service won't accept an upper case query string and returns an error instead. I've updated the code base to address this in the next release. After that was resolved there is an incompatibility in the WSDL. 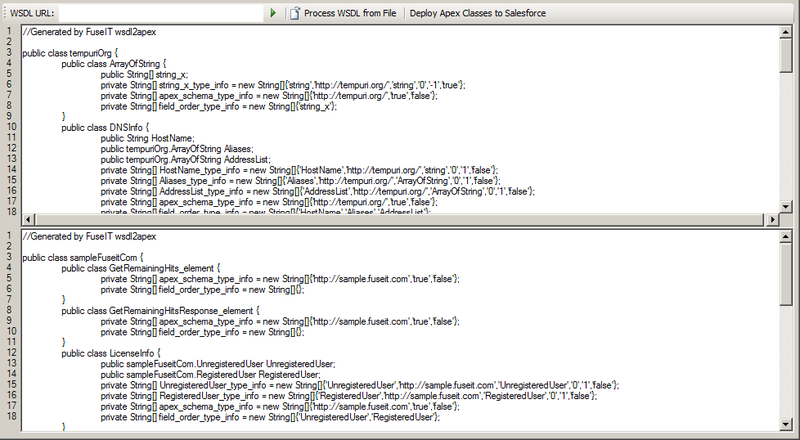 Unfortunately it uses RPC encoding, which isn't supported by the underlying Salesforce methods. When you share the problem report generated by the tool please include the WSDL so I can track the problem down.